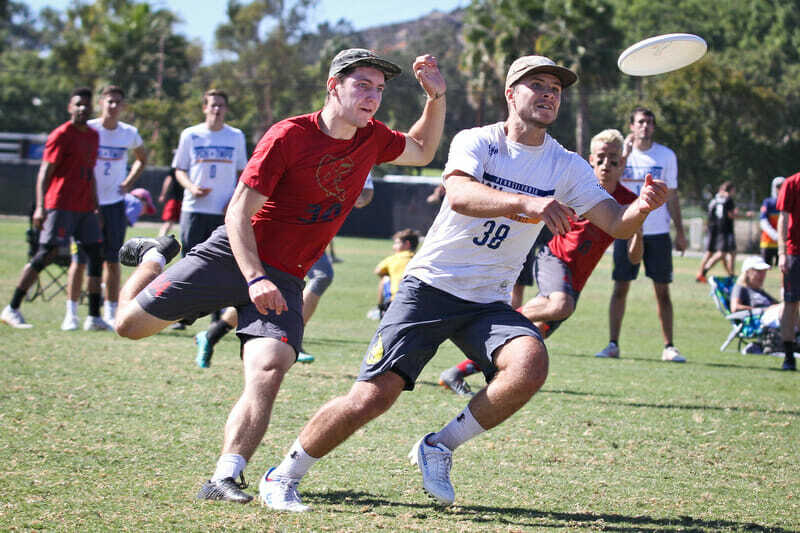 After a terrible 2017 postseason, Seattle Sockeye returned in 2018 with a harder edge and a determination to fight back to the top tier of men’s club ultimate. Despite little access to the country’s best teams during the regular season due to their low finish at Nationals, Sockeye entered the 2018 Club Championships with the no. 2 seed and high expectations. They may not have won a title, but they were clearly one of the best teams at Nationals, giving eventual champion New York PoNY everything they could handle before falling on double game point in the semifinals. While Sockeye’s offensive players tend to get most of the spotlight, the team’s defense was its calling card in 2018. In the upcoming series, we will explore various facets of the Sockeye defense and how they worked in concert to put pressure on their opponents’ offenses. We begin today with a look at their handler and reset defense. When it comes to playing handler defense, proper positioning is everything. With your body in the right place, you’re able to deny certain options and pressure others. Let’s look at how Sockeye achieved this in the 2018 club season in a variety of situations. Comments on "Studying Sockeye’s Defense: Marking Handlers"